If you are beating the winter blues by daydreaming of a relaxing beach vacation to the Alabama Gulf Coast, then we’ve got you covered. When reserving your Spring Break vacation rental, we recommend planning a few local activities that we think are must dos for Spring Break 2015. 1. Relax on the Beach – With 32 miles of sugar-white sand for you to enjoy, we recommend making times to catch the waves and enjoying a little peace and quiet. If your vacation rental is not directly on the beach, click this link for a list of public beaches. 2. Sail Away – Set sail with Sail Wild Hearts this spring and take in the views of the beaches from the water. The 53-foot catamaran cruises daily and offers excursions just off the shore. You can set sail on a daily dolphin cruise or the three-hour adventure sail that includes an island stop, kayaks, paddleboard and snorkeling. 3. Catch the Big One – Alabama is known for the diversity of saltwater and freshwater with inshore and offshore fishing. Get hooked on blue marlin, yellow fin tuna, red snapper and much more. An Alabama fishing license is required when fishing in public waters unless you are aboard a licensed charter boat. 4. Take a Hike – Walk, jog, bike or take a guided golf cart ride through the Hugh S. Branyon Backcountry Trail in the Gulf State Park. Six trails make up 13.5 miles so you can connect with nature. Schedule a 2-hour guided eco-tour with the City of Orange Beach on a covered electric cart. 5. Zip the Gulf – Experience the great outdoors and fly high about the waters on the Hummingbird Ziplines. 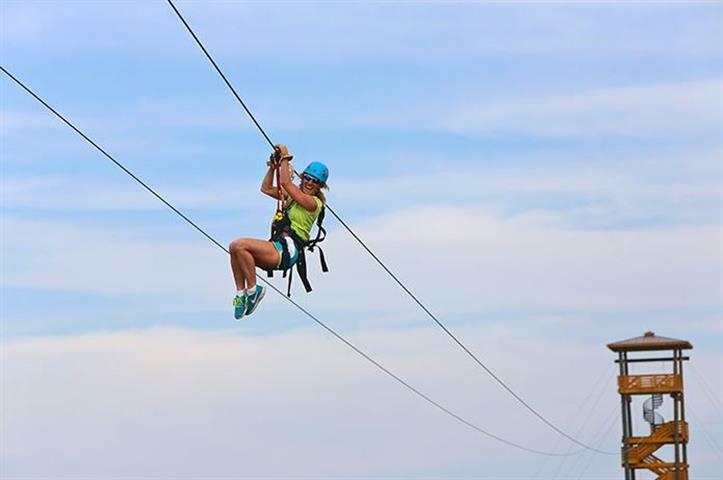 Located at the Gulf State Park, the two hour circuit zipline offers an unforgettable experience and a thrilling adrenaline rush. 6. Go Wild at the Zoo – See lions, tiger and bears at the Alabama Gulf Coast Zoo where you can get up close and personal with over 500 animals. Enjoy spending time with a number of species facing extinction while getting a unique educational experience. 7. Rope the Course – Sharky’s Family Adventure Park is located at the Wharf and features rope courses for participants of all ages. Enjoy the thrills of soaring and testing your balance or challenge your putting skills on the 18 hole miniature golf course.